Did Mark Invent the Sea of Galilee? | Is That in the Bible? Did Mark Invent the Sea of Galilee? Most of Mark’s Gospel prior to the passion narrative revolves around a body of water the author calls the Sea of Galilee. It is the geographical focal point where Jesus calls his disciples, preaches to the crowds, travels (by boat), and performs his miracles — including many that involve the sea itself. It is a dangerous body of water whose raging waves must be quelled by Jesus on one occasion to save his shipmates. There is, in fact, no “sea” in the Galilee region of Palestine. 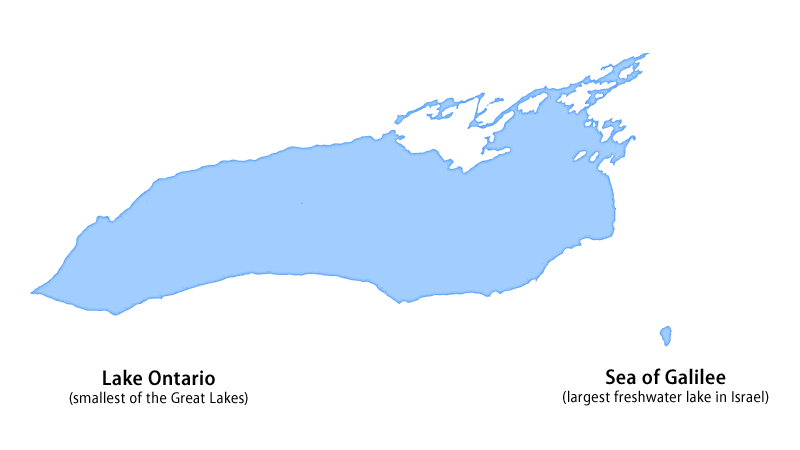 There is a lake in the right location that matches the geographical description of Mark’s sea in many (thought not all) respects. But no ancient writer prior to Mark ever mentions a body of water called the Sea of Galilee, and some of the reasons Mark gives the sea such a prominent role are often overlooked. The largest freshwater lake in Israel went by several names in antiquity. The Old Testament refers to it just three times, calling it the Yam Kinneret (Chinnereth). Unlike many languages, ancient Hebrew did not distinguish between salty and fresh bodies of water; yam could refer to both. The LXX simply translates it as the sea of Chenara (Num 34:11) or Chenereth (Josh 12:3, 13:27). Like English, Greek and Latin did distinguish between lakes (limne) and oceans (thalassa). Josephus variously referred to the lake as the lake of Gennesar, the lake of Gennesaritis, or the lake of Tiberias. Pliny the Elder referred to it as lake of Gennesaret or Taricheae in his encyclopedia, Natural History. Strabo called it the lake of Gennesaritis¹ in his opus Geography. Genessar and its variations come from the plain of Gennesaret, which lay on the northwest side of the lake. The name is ultimately a Grecized form of the Hebrew Kinneret (Chinnereth), which was an ancient city in the upper Jordan valley. Tiberias and Taricheae were two other important Roman cities near the lake, and their names were used to identify the lake in Roman times. Those who know the region well tell us that, in fact, there is no “sea” in the locality but only a tiny lake which springs from a river that flows through the hills of Galilee near Tiberias. Small boats can get across it within two hours. [And the lake is too small] to have seen whitecaps caused by storm. Mark seems to be stretching a point to its extremities when he writes that Jesus—after nine hours had passed—decided in the tenth to walk across to his disciples who had been floating about on the pond for the duration! The other canonical Gospels (including John, in my opinion) were based on Mark and had a tendency to correct perceived errors of geography and history in the material they used. How did they deal with Mark’s references to the Sea of Galilee? Matthew, on the other hand, is content to follow Mark in calling it the Sea of Galilee. In fact, he refers to the “sea” (thalassa) eleven times to Mark’s seven. John adopts a compromise. He calls it the “sea of Galilee of Tiberias” in 6:1, adding the normal Roman name to Mark’s name, and he continues calling it the “sea” afterward. The author of the Johannine appendix also calls it the Sea of Tiberias, probably on the basis of 6:1. Mark, then, is giving the lake in Galilee a name that is unattested in any earlier source, and very possibly an invention of his own. And it’s not just the name; as we saw from Porphyry’s remarks, he treats it in the narrative as a sea rather than the small lake that it is. Some commentaries simply note that calling the lake a sea is a Semitism and leave it at that — as if all is explained. Thiessen (Gospels in Context, 237-39, cited by Collins in Mark (Hermeneia) p. 157 n. 1) went further, arguing for an Aramaic setting behind Mark. But are we really supposed to think that a Greek author writing to a Greek audience didn’t know the difference between a lake and a sea? Other commentators propose that Mark was influenced by the Septuagint, which I find lacking for two reasons: (1) The lake is an obscure geographical feature in the Old Testament, barely mentioned at all. (2) Mark does not use the Septuagint’s name for the sea, Chenara/Chenereth. (After I had nearly finished this article, I discovered that Notley [2009, p. 185] raises the same objection.) Additionally, neither of these explanations helps us understand how the sea functions in Mark’s Gospel. There are two other explanations I think have more merit. Dennis R. MacDonald (professor of religion at Claremont School of Theology) is a well-known proponent of the view that the author of Mark deliberately uses themes from Homer’s Iliad and Odyssey to develop his story. As MacDonald notes in his books, students in the Greek-speaking world used the technique of imitatio to learn composition, and Homer was the most popular model to use. The literary culture was infused with Homer; no literate Greek learned to read and write without acquiring extensive familiarity with the Iliad and the Odyssey. Mimesis, or imitation of famous works, was not considered plagiarism, but a time-honoured technique for composing new stories. To put it another way, there is little doubt that all the authors of the New Testament learned to read and write Greek through extensive study of Homer. Another sea-related parallel is the episode of Jesus walking on the water in 6:45-52. In Iliad 24, the god Hermes has golden sandals that let him walk across the water, and Priam and Idaeus are terrified when they first see Hermes approach at night, much like the disciples’ reaction to Jesus on the sea at night. Hermes then joins Priam and Idaeus in their chariot and leads them to their destination, just as Jesus joins the disciples in the boat to and takes them to Gennesaret². Similar stories occur elsewhere in Homer as well as in Vergil’s Aeneid, which also heavily borrowed from Homer (Ibid. loc. 1049ff). Why the Sea of Galilee? Why did Mark name his sea after the region of Galilee and not call it, say, the Sea of Chenereth as we find in the Septuagint? Geographically speaking, Galilee borders two lakes — the Lake of Gennesaret and Lake Semechonitis a bit further north — so that description already introduces some ambiguities. In the former time he brought into contempt the land of Zebulon and the land of Naphtali, but in the latter time he will make glorious the way of the sea, the land beyond the Jordan, Galilee of the nations. The people who walked in darkness have seen a great light; those who lived in a land of deep darkness—on them light has shined. Do this first, do it quickly, O country of Zebulon, land of Naphtali, by way of the sea, and the rest who inhabit the seashore and beyond the Jordan, Galilee of the nations, the district of Judea. O you people who walk in darkness, see a great light! O you who live in the country and in the shadow of death, light will shine on you! Thus, Jesus’ association with Galilee and “the sea” becomes a means of identifying him as the Messiah. (Eidsvåg, p. 177) And even though the Septuagint clearly intended the Mediterranean Sea, the early Christian community associated it with Lake Gennesaret. Mark may be making a veiled reference to Isaiah 9:1 when, in his second and final reference to the “Sea of Galilee” in Mark 7:31, he has Jesus make a journey from Tyre to Sidon (taking Isaiah’s “way of the sea” to the idealized northern boundary of Zebulon) and then through Naphtali and the Decapolis (Isaiah’s “land beyond the Jordan”) to the sea (Notley p. 187). Whether the toponym “Sea of Galilee” was an invention of Mark’s or of the early Christian community he belonged to (so Notley), it is clearly a theological innovation that associates Jesus with an Isaianic “prophecy” and then-current Jewish views of the region of Zebulon and Naphtali. It was also important for Mark that his story take place on and around a perilous sea — and not merely a placid lake — in order to fully illustrate his views of Jesus. MacDonald’s thesis of Homeric influence throughout Mark might be more controversial than the numerous and well-established cases of imitating the Old Testament, but neither explanation of Mark’s “sea” motif excludes the other. Mark’s Jesus stands in both the Jewish and Greek traditions, commanding the weather like a Homeric deity and subduing the chaotic sea like the God of Israel. For those of us raised in Christian environments, familiarity with Mark’s Gospel may prevent us from appreciating its mythologizing nature. Even the geography of Jesus’ ministry may include elements that have been specially chosen or even invented for their symbolic value. Strabo might have confused Lake Gennesaritis with Lake Semechonitis further north. Nevertheless, his knowledge of the name is relevant. Mark’s geography becomes confusing at this point, however, since the disciples were instructed to cross to Bethsaida (on the lake’s east shore), but they end up in Gennesaret on the wrong side of the lake (on the west shore) after Jesus joins them. Matthew modifies the Greek text of Isaiah further, stating that a light “has risen” on the people — putting it in the aorist tense as a fulfilled prophecy and using the word “rise” to remind readers of the star that rose at Jesus’ birth. The pairing of Zebulon and Naphtali has additional meaning for Matthew. The twelve tribes and their associated regions took on additional layers of meaning in the Targums being written in the first and second centuries. Zebulon was the seaside-dweller, a merchant and master of boats as well as the tribe of Jonah, an archetype for Jesus in the Synoptics. Naphtali, where Jesus’ hometown of Capernaum was located, was a fisherman and a messenger, the “bearer of good news”. This symbolism almost certainly must also underly Mark’s narrative of a Jesus who disciples fishermen and crisscrosses between Zebulon and Naphtali throughout his ministry, though it is made more explicit in Matthew. See Derrett and Tassin below. R. Joseph Hoffman, Porphyry’s Against the Christians: The Literary Remains, 1994. Elizabeth Struthers Malbon, “The Jesus of Mark and the Sea of Galilee”, JBL 103/3 (1984), pp. 363-377. D.E. Nineham, Gospel of Saint Mark (Pelican Gospel Commentary), 1968. Adela Yarbro Collins, Mark: A Commentary (Hermeneia: a Critical and Historical Commentary on the Bible). R. Steven Notley, “The Sea of Galilee: Development of an Early Christian Toponym”, JBL 128/1 (2009), pp. 183-188. Dennis R. MacDonald, Mythologizing Jesus: From Jewish Teacher to Epic Hero, 2015. Gunnar Magnus Eidsvåg, The Old Greek Translation of Zechariah, 2016. J. Duncan M. Derrett, “Ἦσανγὰρἁλιεῖς (Mk. I 16): Jesus’s Fishermen and the Parable of the Net”, Novum Testamentum 22/2 (1980), pp. 108-137. Claude Tassin, “Zabulon et Nephtali dans le Targum : un éclairage de Mt 4,13–16 ?”, The Targums in the Light of Traditions of the Second Temple Period, 2014. Fascintating post! I love the detail into which you have gone on this, and the Old Testament origin of Mark’s sea had not occurred to me previously! Thanks for the fascinating article. Excellent critical points concerning the veracity of the “walking on the water” story. Was Mark Confused Pertaining to the Location of the Feeding of the 5,000? Any comments would be appreciated. I will be critiquing Lydia McGrew’s new book on “Undesigned Coincidences” after it is published. I derive nerdy pleasure from analyzing geographical references, so maybe I’ll tackle that one if I have time. Very interesting. I never knew this before or paid any special attention to the “Sea of Galilee.” Thanks. I don’t know if you’ve ever considered doing an analysis of the pericope of Abraham & Isaac going off to Mt. Moriah. A while back others were debating the origins and meaning of it, so I came here to see what you might have said about it, but discovered it had not been covered yet. Just a thought. Excellent – I’ve wondered about this for years. I just found this through a link over at Slacktivist and this is one of those areas of my fascination, so I thought I would add my two cents to your already pretty great write-up. There’s a passage in Xenophon’s Anabasis where the soldiers, who have just traveled overland from Mesopotamia to the shores of the Black Sea in northern Anatolia, see the sea for the first time and break into a run shouting, “Thalassa!” Because for the Greeks the sea was home. That’s kind of the entire point of the Anabasis, really, that having to actually walk overland is an arduous task that has taken them far from their people. So when they get to the sea they know that they are “home” in the sense that the sea is where the Greeks feel most comfortable and that there will be poleis nearby that they can reach and that, ultimately, they can get a boat underfoot and get home quickly now. So if the writer of Mark was actually a Greek speaker and familiar with the Greek world and specifically chose to turn a small lake into a great and raging sea and place certain events that couldn’t possibly have taken place on or near the sea in this place it’s definitely a statement. He might have been writing his own Odyssey, as the article seems to suggest. He might also have been attempting to invert the story and declare the Jewish system of thought superior to the Greek. I would actually say that the inversion of Greek opinion of the sea is the more likely explanation, as the Gospels are mostly propaganda and each Gospel is aimed at a different group. So if you’re expecting an audience that’s familiar with the Greek way of thinking (and after hundreds of years under the Ptolemys and then the Antiochuseses and then the repackaged Greek culture that was Rome, well…) then one of the key places to start would be bringing up the sea. For the Greeks the sea is home. For a Jewish audience the sea is a mysterious place that’s filled with death and monsters. Now that I think about it the sea never really does appear in Jewish documents. There’s the splitting of the Red Sea and the story of Jonah and, well, that’s about it. So every time the sea shows up in Jewish mythology it’s to tell of how god mastered the sea or used it to punish. This, too, would bring us back around to an argument between Jewish thought and Greek thought. If Jesus can tame the raging sea then he is more powerful than the Greeks. On a mythological level Poseidon got nothing on Jesus. On a literal level Jesus has declared that he doesn’t even need a boat to cross the water, which is a claim even the Greeks can’t make. And so but anyway, yeah, this was a really interesting and thought-provoking read. Great article. I’m curious, how did the early Christians respond to Porphyry’s criticisms? It makes me wonder what else in Mark’s gospel is theological and not historical…in particular, the Empty Tomb story. Could you provide a stronger declaration/testimony regarding the storminess of Galilee? While I have so far only encountered Christian sources, the sea as stormy was backed up in each case was supported by the peculiarities of its geography. The Lake Kinneret meteorology site, at least, indicates regular dips and spikes in wind speed up to 12 m/s (about 30 mph), such increases being the regular claimed grounds, in conjunction with the lake being shallow, for storm violence. Yeah, I’ve seen a lot of Christian sources all citing the same 1992 storm as proof Lake Kinneret is a violent sea. I’m not terribly convinced. The damage to the port was, if I understand correctly, caused by higher lake levels flooding the area. One must remember also that Lake Kinneret was smaller with lower water levels in antiquity; a dam built in the 1960s changed it dramatically. 10 m/s (the maximum wind speed in summer according to the book you linked) is not a very fierce wind — it’s categorized as a “strong breeze” on the Beaufort scale, whereas strong gales start at 21 m/s and violent storms at 28.5 m/s. Where I live, storms of 30 m/s and up are not uncommon. At this point then, I think I should just argue that the notion of a “great storm” is being over-read. At the very least, from the little I’ve looked at, it does not seem to be that an all-that “great” storm would be needed to endanger the type of smallish fisherman’s boat the Gospels usually portray. The Jesus-in-the-stern accounts only have the boat getting waterlogged (i.e. the water just has to breach the boat’s height), right? Interesting article, but I think you’ve simply been confused by the point of this phrase, “Sea of Galilee”, being an obvious Aramaism. Instead of picking up fringe ideas such as MacDonald’s incredibly tenuous thesis, it’s been demonstrated that not only is “Sea of Galilee” a possible Aramaism, but, in fact, a directly accurate Hebraic and Aramaic construction. This is basically demonstrated. See Yarbro Collins, Mark: A Commentary, 8. The fact is, as Joanna Dewey of the Jesus Seminar points out, that all that’s happening is that “while referring to the lake of Galilee as the “Sea of Galilee” is not typical of Greek or Latin usage, it accurately reflects the Hebrew and Aramaic construction.” See pg. 104 in Dewey’s paper here. So if you have a problem with Mark’s wording, you should take it up with the Aramaic language rather than imposing modern English on Mark. Thanks for the comment. As I explained above (and cited Collins in doing so), I don’t find the explanation convincing, nor does it explain the other peculiarities of Mark’s treatment of the Sea of Galilee. Furthermore, Dewey’s article notwithstanding, I don’t think a Galilean provenance for Mark is very likely, nor is it a widespread position held by scholars. I think there are clues pointing to a Roman provenance, not least of which are the many Latinisms in Mark. Suggesting I have a “problem” with Mark’s wording is a very poor way to summarize my article. Rather, I am intrigued by Mark’s wording and its significance to Mark’s theology. Paul, I know you cited Collins, but the problem is that Collins says you’re wrong. I find it extremely odd that you argue that because you don’t understand how the Aramaic connects to Mark’s Greek (because you can’t read Aramaic) that scholars of Aramaic consider self-evident, therefore it must be wrong (personal incredulity fallacy). I haven’t a personal conclusion on the provenance of Mark’s Gospel, but it’s clear you’re unfamiliar with the scholarship on this discussion as well. Galiliean provenance certainly is a widespread position, in fact, the field seems directly fragmented between Rome, Syria, and Galilee. There was a consensus that it originated in Rome up until the 1970’s, but that completely fragmented since at least the turn of the millennium. Your statement that Latinisms are incompatible with Galilean provenance also suggests you don’t understand how hellenized Galilee had been when Mark was written. That’s not my argument, so I don’t know why you would put it that way. I understand perfectly well that Aramaic does not distinguish between lakes and seas, and that Aramaic or Semitic influence is a valid and possible explanation. It would be more satisfying if that were the only odd thing about Mark’s geography, but it is far from it, and there is much more that needs explaining (hence this article). Bas van Iersel… has demonstrated that Theissen’s argument [for Aramaic influence in Mark] is not quite as convincing as it might first appear. In response to Theissen’s conclusion regarding Thalassa tes Galilaias, van Iersel notes Theissen’s failure to consider the evidence of the Septuagint, a text not only familiar to Mark but one that influenced him. In the Septuagint, Thalassa is commonly used to refer to bodies of water that are smaller than an actual sea. The Sep­tuagint also uses genitive constructions to specify the identity of a particular body of water or region, e.g., Thalassa Ioppes (2 Chron 2:16 and 2 Esd 3:7 in reference to the Mediterranean Sea) and Thalassa Chenereth (Num 34:11, Josh 12:3; 13:27 in reference to the lake of Gennesaret!). In light of this evi­dence, Theissen’s conclusion that the presence of Thalassa tes Galilaias in Mark betrays a rural Aramaic milieu is unnecessary. This unique phrase may simply betray the influence of the Septuagint on Mark. At the time I researched the article and took my notes, I didn’t have access to van Iersel’s book, but I do now. He spends several pages giving reasons why Rome is to be preferred over Syria and Galilee. Lane, in his commentary on Mark, spends several pages arguing for a Roman background. These include numerous technical Latinisms (and Latin does not equal hellenization; hellenized regions like Galilee did not speak Latin), the mention of coinage that circulated in Rome but not in Galilee, the use of Roman time reckoning, and an explanation of Palestinian customs and Aramaic terms his audience was apparently unfamiliar with. Incigneri in The Gospel to the Romans (2003) also devotes an entire section to arguing case for Roman provenance based on latinisms, familiarity with Roman customs, and church tradition. Malbon (1984) and Beavis (2011) are two modern scholars who note the symbolic possibilities of Mark deliberately calling it a sea instead of a lake. I also think, for reasons I don’t have space to give here, that Mark was familiar with Josephus’ Antiquities, and he is more likely to have had access to that work in Rome where it was first written and circulated. I understand there are other reasons Syria or Galilee are proposed. On the balance, I find them less convincing. This is hardly a fringe view like you suggest.